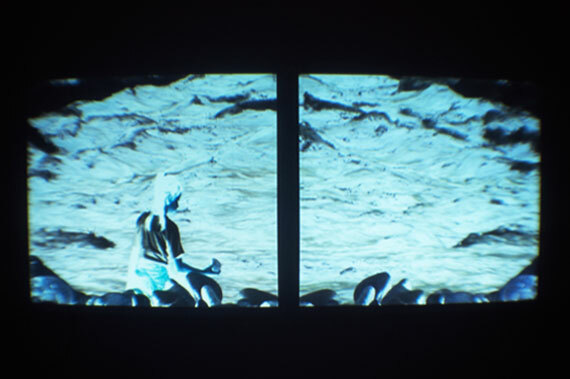 Double Video projection: "Toyohira River girl". From the 20th of November 2001 new work of Marjan Laaper was shown at the Contemporary Art Institute in Sapporo. This work was made during her time as an artist in residence on the S-AiR program between September – December 2001. in Japan. The artist took as her starting point everyday scenes shot in Sapporo. looks like a negative.) It forms a panoramic view of what could be a river landscape. There's a girl looking out across the water. Every now and then, she throws a stone in. She seems overwhelmed by the immense power of this mass of water. explores the relationship each of us has with these universal forces as individuals. How many stones do you have to throw into a river before you alter its course?